One of the reasons that Freeview does not reshuffle the channel numbers is because there is a lot of value in the lower numbered slots in the electronic guide. I thought it would be interesting to take a look. At first viewing, it certainly seems that the number of years a channel has been on air relates strongly to the current number of viewers. BBC 1 was November 1936, ITV September 1955, BBC 2 in 1964, Channel 4 in 1982 and Channel 5 in 1997. 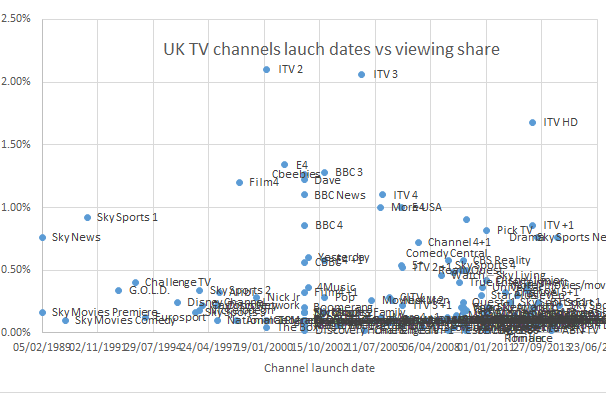 However, Sky 1 bucks the trend here as it was on air in 1983 and has less than 1% of viewers. Let's look at the bunched-up data in the corner a bit more. The next graph starts in 1989 and shows up to 2.5% viewing share. At this level it seems that the only thing bring in viewers being an extended channel from an existing public service broadcaster. How about the Sky number? 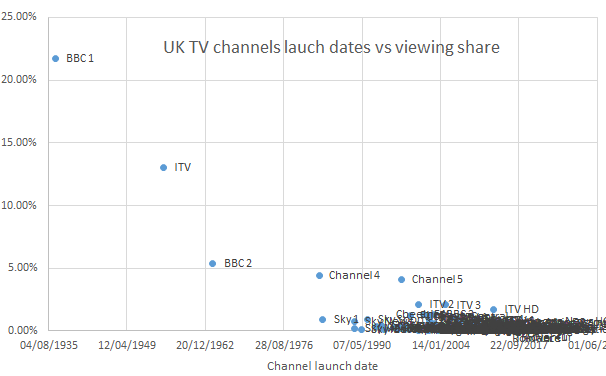 The third graph has excluded the five big channels, and shows the rest with their Sky Guide number. It is interesting to see that there doesn't really appear to be any pattern. How about the Freeview number? Finally, the Freeview graph. I have limited the channels to 6-71 because the News and Children's channels have just migrated to new numbers. I've dawn on a green line because I think there is a kind-of pattern to the Freeview list. It does seem – as the green line shows – a sort-of-relationship. 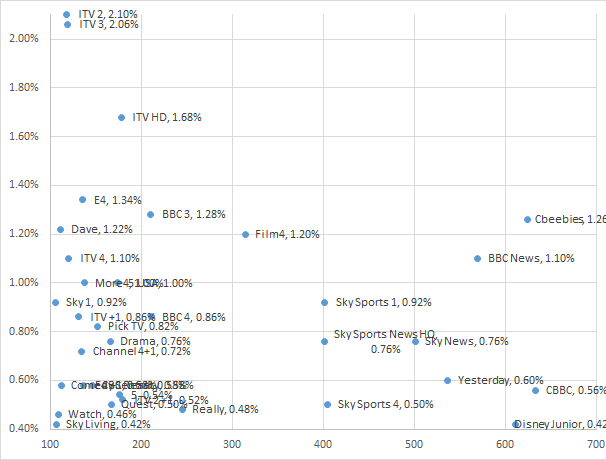 However ITV 2, ITV3, E4 and CBS Reality seem to buck the trends. So, in conclusion is does seem correct that higher numbers mean less viewers, but some can buck the trend. Hi ,Brian,I have been , watching the digitally remastered ,Star Trek , original series on CBS , not an HD channel ,but it does look fantastic ,& maybe in future you could do a little on digital remastering , & putting a 4.3 format into 16.9 . The sound & special effects have all been redone , with a bit of CGI in scenes where the cast are present . I think all the external scenes of the Enterprise have all been reshot in 16.9 , but the live action reformatted from 4.3 . Anyhow, all your articles are very good , thanks. 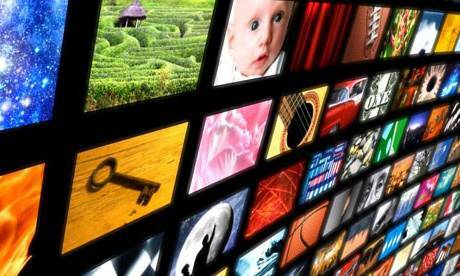 When we went digital I thought it would be a good idea to colocate all the BBC channels 1st, then all the ITV ones, then channel 4 and its fellow channels, then channel 5 and its fellows and finally the rest. The idea being that I could then find everything easily but what I have found is that I now watch BBC channels most of the time because I start channel flicking at BBC1 and rarely get as far as ITV1 before I find something interesting. Richard E: Before a tree came into foliage, I was able to see the german HD channels on Astra 1 at 19.2deg.east and one of them showed the re-mastered original series and it is clearly HD quality but then it was shot on film originally and film has always been 'HD'. The soundtrack was dubbed german of course. Higher the channel number, fewer viewers? I don't think this is anything to do with the number of the channel. I suspect my viewing habits are not the same as others, however I only use an EPG to set up recordings. I record everything we want to watch, but that's another matter. When selecting programmes to watch I, probably in common with others, read the information provided in the Daily Mail free weekly guide, similar to Radio Times, but infinitely cheaper. It just so happens that very little of each day's programmes from the obscure (higher numbered) channels have much of description of what the programmes are about due to lack of available space hence one invariably chooses to watch (or avoid) programmes where there is a reasonably comprehensive description of what one might be letting oneself in for. If the Radio Times or Daily Mail guide could be persuaded to use more space letting potential viewers know what will be coming up with the higher numbered channels then probably more viewers would have a go with at watching something they would otherwise miss. Lets face it the paper guides use most of the space describing the usual guff from the main channels which is somewhat of a waste as we all know what's coming up anyway. It might also be worth considering 'habit', I ask my sister-in-law why she always watches Coronation St? Answer, " Because I always watch Coronation St." One thing I would like to see, which doesn't come up on EPG, for any programme, or paper guides for BBC4 programmes, is whether a programme is a repeat. "alternative" channel that I regularly viewed was UK Gold after Carlton Select and Bravo (the timewarp television version) had stopped broadcasting. Jack: Thanks for the comments. many thanks for the link. Not sure how you got into it as my attempts to do the same resulted in the schedule but without the 'R' indication, BBC iPlayer - Channel Schedule - BBC Four - Wednesday 22 October 2014 I've no idea how iPlayer got into the address, but never mind, the link you provided will suffice, I've changed the date in the address bar, bookmarked the page and can now select advance dates with no problem. When I get the week's Daily Mail guide I will be able to pencil in an 'R' where appropriate. This will save my wife and I from discussing, while watching a BBC4 programme, on the lines of " I'm sure we've seen this before". "When we went digital I thought it would be a good idea to colocate all the BBC channels 1st, then all the ITV ones, then channel 4 and its fellow channels, then channel 5 and its fellows and finally the rest." This is easy enough to do if one has satellite and an FTA receiver which allows creation of one's one channel lists and your scheme is in fact the one I use for 28,2 East. Also most quality Freeview receivers do allow channel renumbering so you can in put the stations on your preferred channel numbers eg BBC-1 HD on 1, BBC-2 HD on 2, BBC-3 HD on 3, BBC-4 HD on 4,BBC News HD on 5, BBC Parliament on 6 etc. 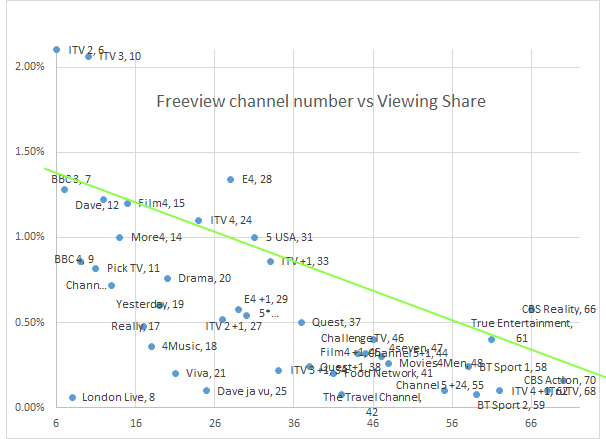 Good work, but remember channels which like Dave Ja Vu and ITV4+1 will have next to no viewers on Freeview, since they are only on in the middle of night. In my opinion such LCN squatters should be relegated to the end of the entertainment section after a month or two, and they'd soon disappear, because there would be no point of broadcasters having them.